There are two ways to copy files to multiple destinations. To copy to many folders at once see the the topic Copy to Many Folders which efficiently copies files and even folders to hundreds and thousands of folders on your computer, server or network at one time. Enter the list of folders you want the selected files and / or folders in the Destination(s) field as shown highlighted in yellow above. Each path must be separated with a comma, a semi-colon or the bar character (, ; or |). To quickly enter multiple folders use the Browse button to the right of the field which will display a folder picker when you can select one or more folders that FileBoss will enter into the Destination(s) field for you. Note the Multiple Selections box near the bottom of the dialog. 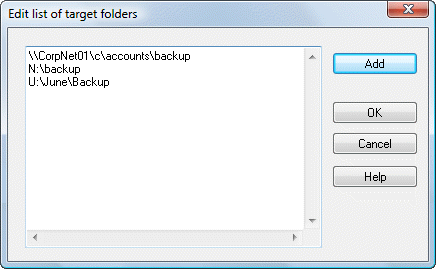 When it is checked you can select multiple folders. To manage multiple directories use the Edit button to the right of the Browse button. This will allow you to edit the paths that are currently displayed.